Jesus said, "Truly I say to you, God will not leave one stone of this mosque upon another but will destroy it utterly because of the sins of its people. God does nothing with gold, silver, or these stones. More dear to God than all these are the pure in heart. Through them, God builds up the earth, or else destroys it if these hearts are other than pure." Commentary: Notice the shift from temple to mosque as Jesus' sayings enter a new religious environment. This is a sign of oral traditioning, when the tradent speaks to a new audience and updates the old material so that it continues to be relevant. This sort of shift is very common, even in the Christian materials which also continued to accommodate Jesus' sayings to different Christian environments. 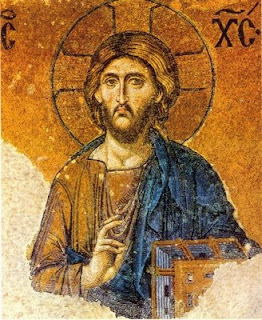 Mosiac is famous portrait of Jesus in the mosque, Hagia Sophia, Istanbul. Until you mentioned it I didn't see it...temple to mosque...very interesting! Come on April, the man had a copy of the NT in front of him. Is the protrait in fact a Christian portrait purloigned by Muslims from what was once a Christian Basilica? After their conquests of what were Christian lands, the Muslims would have had no shortage of Christian artefacts, including complete copies of New Testament writings for Muslim clerics to compose their cribs from. Note that the dome of the original basilica is dominated by four taller minarets added by Muslims - a feature common in Muslim states wherever there are churches and mosques together. It is done to to remind the Christians of their lower status. Of course they had access to written gospels. But this doesn't mean that the written texts weren't orated and didn't become part of the oral traditioning process!